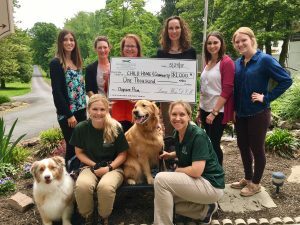 DOYLESTOWN, PA, May 31, 2017—Child Home & Community (CHC), a non-profit social services agency based in Doylestown, received a $1000 donation from Holiday House Pet Resort & Training Center Dog Daycare. The money was raised through generous donations from resort clients during a special event. 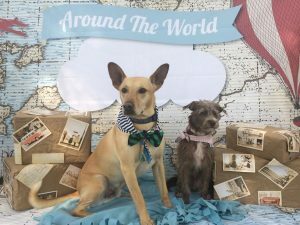 The Resort’s dog daycare program held a dog prom and after-party for the pet parents. For a donation to CHC, daycare clients received an official prom photo of their dog. “We truly have the best clients. Their willingness to generously support an important organization that provides a great service to young parents throughout the community was wonderful,” said Dr. Laura Weis who owns and operates the resort and Doylestown Veterinary Hospital with her husband, Dr. Randy Weis. 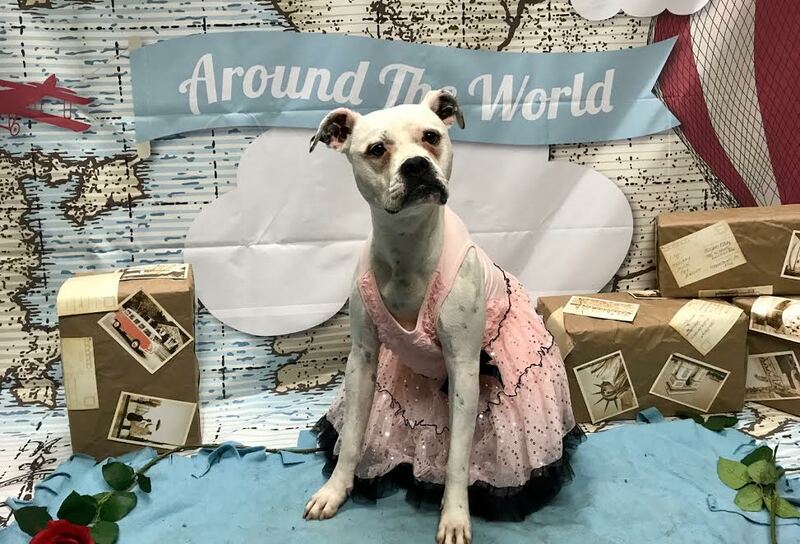 The Around the World prom theme–chosen by Holiday House Pet Resort & Training Center staff and votes on Facebook–celebrated the heritage of the dog breeds that make up our daycare group and resort family. Decorations adorned the facility transporting clients and staff to famous sights around the globe. “The dogs are keenly aware of the excitement and buzz during special events. Our daycare program is very focused on the wellness and enrichment of every dog. The dogs are family, so when our staff has fun, the dogs have fun. It’s a positive experience, and the benefits extend beyond the resort,” added Dr. Weis. The Prom after-party for parents was a special opportunity to thank daycare clients and to bring people together. The Around the World backdrop added to the fun giving families the chance for a group photo and the time to chat with staff and other daycare families. Child Home & Community provides free prenatal, parenting, life-skills and prevention education to teens and young adults residing in Bucks and Montgomery counties. The agency offers evening childbirth/newborn care and parenting programs at 7 local hospitals and has established school-based programs in 19 school districts and sites to provide education, support and advocacy during the school day. For more information about Child Home & Community, visit www.chcinfo.org or call 215-348-9770. Holiday House Pet Resort & Training Center offers overnight lodging for dogs and cats with activity packages, daycare, professional training programs, and grooming services. The facility is owned by Drs. Laura and Randy Weis, who also operate the Doylestown Veterinary Hospital & Holistic Pet Care, a full-service veterinary hospital located on the same property. For more information about Holiday House Pet Resort & Training Center, visit https://www.holidayhousepetresort.com or call 215-345-6960.